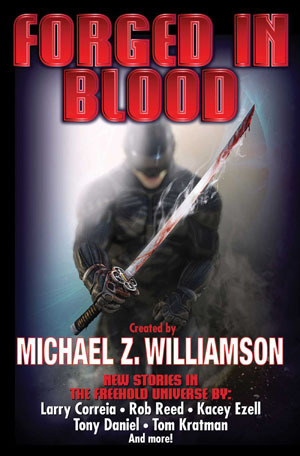 NEW STORIES SET IN MICHAEL Z. WILLIAMSON'S FREEHOLD SERIES. WARRIORS AND SOLDIERS TIED TOGETHER THROUGHOUT TIME AND SPACE. From the distant past to the far future, those who carry the sword rack up commendations for bravery. They are men and women who, like the swords they carry, have been forged in blood. These are their stories. In medieval Japan, a surly ronin is called upon to defend a village against a thieving tax collector who soon finds out it's not wise to anger an old, tired man. In the ugliest fighting in the Pacific Theater, an American sergeant and a Japanese lieutenant must face each other, and themselves. A former US Marine chooses sides with outnumbered Indonesian refugees against an invading army from Java. When her lover is stolen by death, a sergeant fighting on a far-flung world vows vengeance that will become legendary. And, when a planet fragments in violent chaos, seven Freeholders volunteer to help protect another nation's embassy against a horde. Featuring all-new stories by Michael Z. Williamson, Larry Correia, Tom Kratman, Tony Daniel, Michael Massa, Peter Grant, John F. Holmes, and many more. Mass Market Paperback due out September 25, 2018.